Soon to be Summer. If we're lucky the weather will get warmer and with that can bring humidity, for me that means leaving behind most powder formula and replacing those with creams. Once upon a time, I was scared to wear blush, the thought of wearing blush intimidated me as I saw a lot of people wearing blushers in a manner that I didn't like so I stayed away until I realised, it can complete a nearly beat face. Now I love blush but I have quite a great deal of powder blush so I'm building up the cream blush section of my drawers. 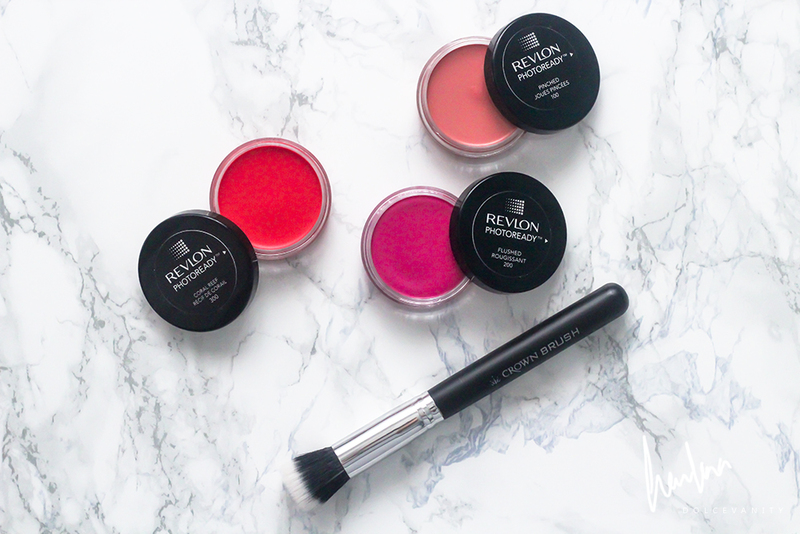 Enter Revlon PhotoReady Cream Blush. I don't have much of an opinion of Revlon as a brand but these were recommended and I believe these are a staple in the credible and talented make-up artist Lisa Eldridge's kit. 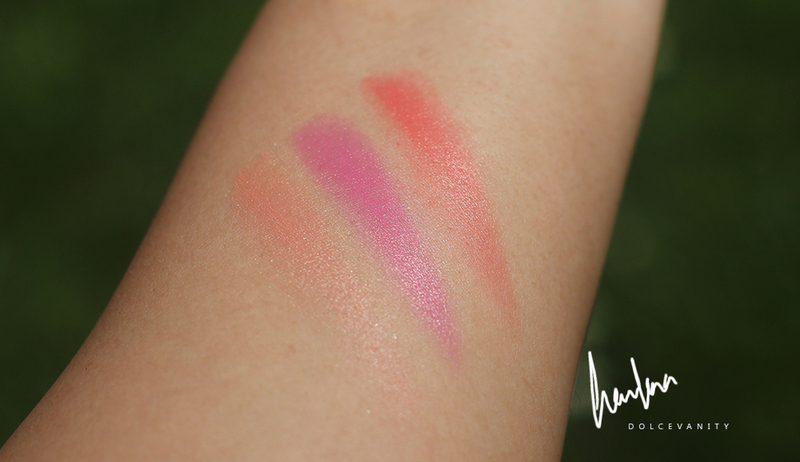 I only have 3 of the shades Pinched, Flushed (discontinued - I have back-ups) & Coral Reef. The other I would like to pick up is Charmed. They look very out there in the pots, like whoa! As you can see when swatched (each swatch has about 2 - 3 applications) it's sheer, as it goes downwards, the colour itself is pretty sheer so it's buildable. Pinched light peach / apricot with slight shimmer. It is the lightest shade available. Even on the inside of my arm it was hard to show up, so probably good for those with fairer skin. Although you could use it as a base and go over with a powder blush to give it more of an intensity. Flushed bright fuchsia great for all complexions especially darker skin tones you could get such a nice pop with this after building it. Yet it's good for all skin tones. Coral Reef bright orangey coral. Definitely for those with a warmer complexion than a cooler one. Cream blush can be more natural in the sense that it gives you more of sheen / glow and it becomes skin like. It's easier to use very little than too much at once. You can blend and build with these to get your desired pigmentation. Applying with fingers is great as the warmth of the fingers warms the blush and when it connects with the skin it melts in. I like to blend out edges with whatever I just applied my foundation with to get rid of the edges or this stipple brush from Crown. However you like to apply your cream blush is ideal, as it's your preference. I like to do it after my foundation then continue onto the rest of my face such as powdering. As I said before you could pair a cream blush with a powder blush for more longevity or intensity with the colour as the powder has something to adhere too. Cream blushes can also be used for glossy lids or as a lip stain, so you've got a multi-use product. I'm quite happy with these you can pick these up in Boots Revlon PhotoReady™ Cream Blush or for cheaper on eBay. Are there any cream blush fans out there? Lusting over the gorgeous peach shade! Ultimately I think I'm a powder girl at heart however at this time of year I too find myself reaching for cream options instead. I have never tried these and yet on more than one occasion have found myself seeing them in clearance stands in Boots, I'm kicking myself now for not picking one up. I absolutely love this cream blush from revlon, I own the flushed shade and it's my definite go-to! <3 Lovely post and pics! These are beautiful! I love the finish you can achieve with cream products!